Nifty ETFs — or exchange traded funds — invest in stocks that are a part of the Nifty 50 Index. Its main objective is to try and replicate the performance of the index by buying the same stocks in the same proportion as they are in the index. Nifty 50 Index is the benchmark index on the National Stock Exchange and includes the 50 most liquid stocks of the largest companies in the market. Limited risk: Nifty ETFs invest in blue-chip stocks on the Nifty Index. Blue-chip stocks belong to the largest companies in the country. The common wisdom is that blue-chip companies offer stable returns over the long-term and also provide security from market volatility. Cheaper option: Investors have the option of buying individual blue-chip stocks. But buying solo can be an expensive affair. For example, the price of one Reliance Industries stock is above Rs 1,100, while an HDFC stock trades above the Rs 2,000 level. Therefore, buying stocks of all the 50 companies can drill a hole in your pocket. Nifty ETFs, on the other hand, allows investors to put their money in blue-chip companies in a cost-efficient manner. No research required: Most people stay away from the stock markets due to a lack of knowledge. However, Nifty ETFs don’t require any research because they simply buy the stocks that are present in the Nifty 50 Index. Moreover, investors benefit from the Nifty Index’s policy of replacement. Only those companies performing get to remain in the index. Those who don’t are shown the door, with better performing companies taking their place. Simple to understand: Unlike mutual funds where investors depend on the expertise of fund managers, Nifty ETFs have no bias, no judgement while buying stocks — it simply buys stocks that are present in the Nifty. Instant diversification: The Nifty Index consists of the 50 most valuable stocks spanning more than a dozen sectors of the Indian economy. Therefore, investing in Nifty ETFs gives investors diversification, which is important because it reduces the risk factor. For instance, let’s assume that IT and pharmaceutical sectors are underperforming. 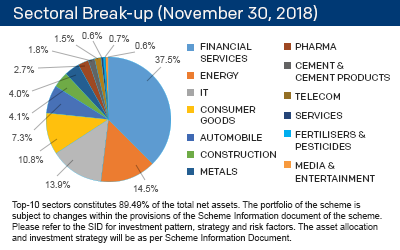 In this case, the investor can still rely on the remaining sectors to offset the losses. High liquidity: Nifty ETFs prices are updated throughout the day, which allows investors to trade them at any time of the day. On the other hand, mutual fund prices are updated at the end of the day, compelling investors to give their buy or sell order without knowing the real-time value of the fund. Easy on the pocket: Nifty ETFs are passively managed. In simple words, fund managers don’t have to rely on their research to pick the right stocks. All they need to do is ensure that the ETF has bought the Nifty stocks in the right proportion. That’s the reason why the expense ratio is the lowest among all mutual funds. For example, the ICICI Prudential Nifty ETF has an expense ratio of just 0.05% per annum. Lastly, the Nifty ETF doesn’t have a ‘load’ scheme for joining or leaving the fund. 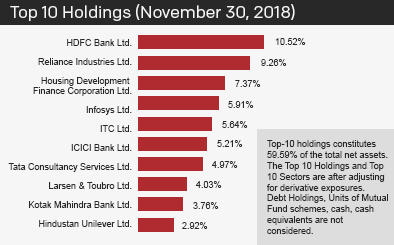 Stable returns: Since Nifty ETFs invest in blue-chip companies, these funds suit investors who are looking to invest for the long haul but with limited risks. For instance, ICICI Prudential Nifty ETF has delivered 10.34% returns (for SIP investors) and 12.59% (for lumps investors) since its inception in March 2013. There is a slight variance in the delivery model because SIP returns are calculated by XIRR approach and the lumps returns are in CAGR. Note: For lumpsum performance, returns less than 1year is in Absolute terms, greater than 1year is in CAGR terms. For SIP performance, the returns are calculated by XIRR approach assuming SIP investment of Rs 10,000 on the 1st working day of every month in the Scheme. XIRR helps in calculating return on investments given an initial and final value and a series of cash inflows and outflows with the correct allowance for the time impact of the transactions. The performance of the scheme is benchmarked to the Total Return variant of the Index. Past Performance may or may not be sustained in the future. How is the Nifty ETF priced? Let’s explain with the example of the above mentioned ETF. One unit of the ICICI Prudential Nifty ETF is 1/100th of the Nifty index. It basically means that if Nifty is trading around 11,500, the value of a single unit would be Rs 115, depending on demand and supply. As on October 31, 2018, the value of a single unit stood at Rs 107.99. If you are an investor and want to invest in Large Cap index for the long-term, a Nifty ETF may be right for you. Please note past performance is no guarantee to future performance though. If you are a cautious investor and want to invest for the long-term, a Nifty ETF may just be the right fit for you.